Flowers uplift the spirit, and bring added happiness and joy to any occasion. Flowers and décor add a beautiful slash of color to your Maui wedding. Flower lei are an integral part of every Hawaiian wedding, and you have the option to include a lei exchange in your ceremony. In Hawaii, it’s traditional for the men to wear either the traditional maile lei, or the maile ti lei. The maile ti lei is made from the ti leaf and is considered good luck in Hawaii. It’s quite common for the bride to have a bridal bouquet, as well as a flower lei and flowers in her hair. 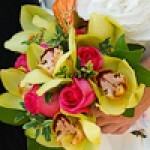 Most popular for bridal bouquets are our vibrantly colored tropical flowers. Choose your favorite colors and allow our florist to create a beautiful wedding bouquet for you. For your bridal party and your parents, it’s customary in Hawaii to present them each with a flower lei or keepsake lei such as Kukui Nut or Ti Lei. We can even add this as part of your ceremony. We can also add a lei presentation to the ceremony to include your children, as a symbol of becoming a family. 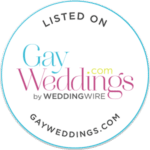 From the bridal bouquet to the Hawaiian lei, we offer a full selection of Maui wedding flowers & décor for your Maui wedding or Maui vow renewal ceremony, customized to your requests. If you don’t see what you are looking for here, please inquire. As your Maui wedding coordinator, I’ll do my best to fulfill your floral requests. Call us at 808-280-2388 for a free consultation, or complete our contact form and we will respond within one business day. Mahalo!